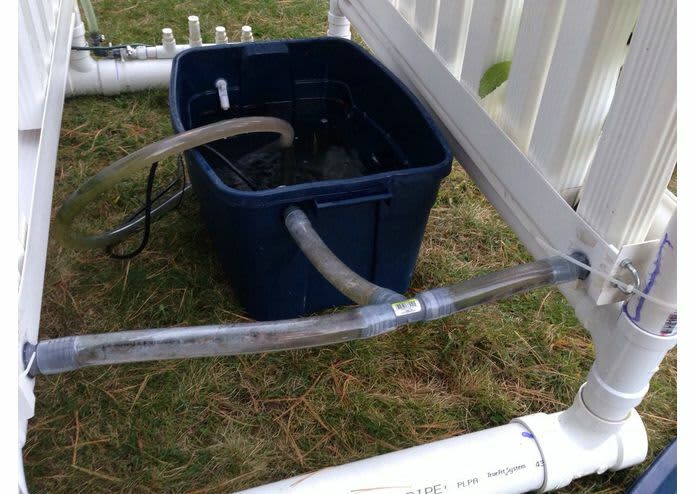 A DIY hydroponic oasis with parts from your hardware store and enough capacity for 160 plants. 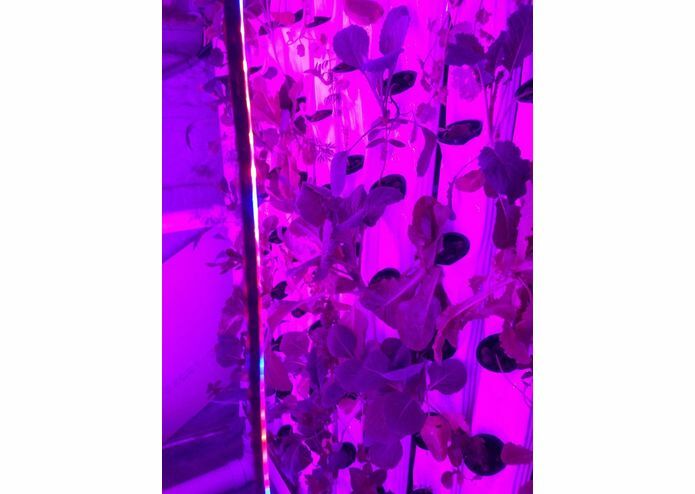 What is "Urban Hydroponic Oasis"
Hydroponics is a subset of hydroculture and is a method of growing plants using mineral nutrient solutions, in water, without soil. The word hydroponics technically means working water, stemming from the Latin words "hydro" meaning water, and "ponos" meaning labor. Many different civilizations from the beginning of time have relied on hydroponics for growing plants, such as the early Mexican and Egyptian civilizations. 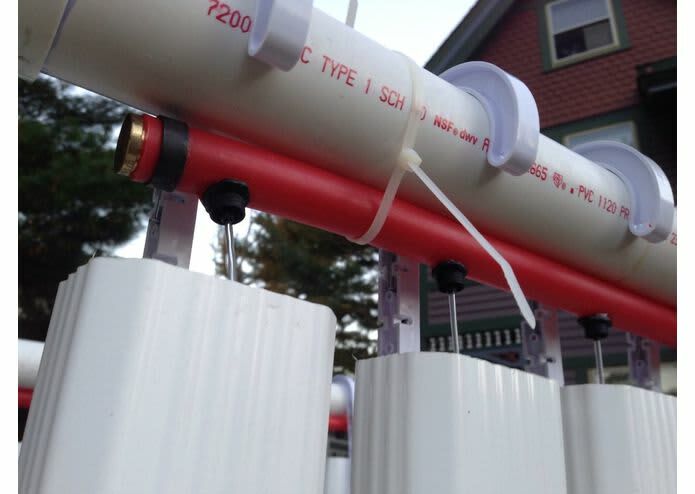 However, recently growing hydroponically has grown in popularity and use across many different markets. 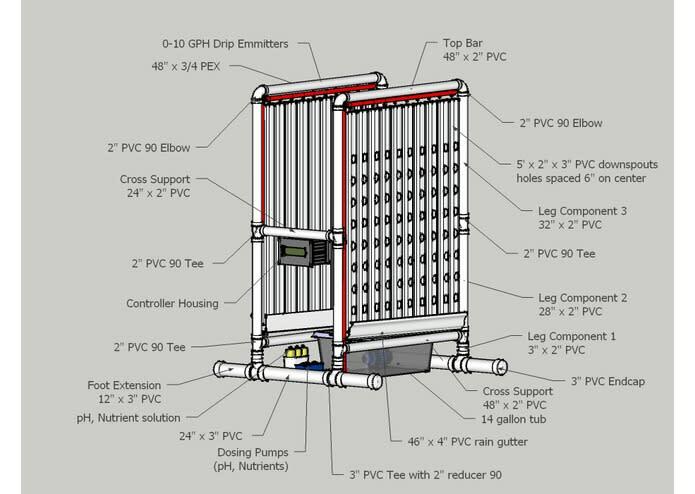 Water is recirculated which allows for great efficiency, often more than 90% efficiently on water consumption. Our vertical design allows for a higher density of plants in a much smaller footprint. With a space less than 5' x 5' we are growing 160 plants. 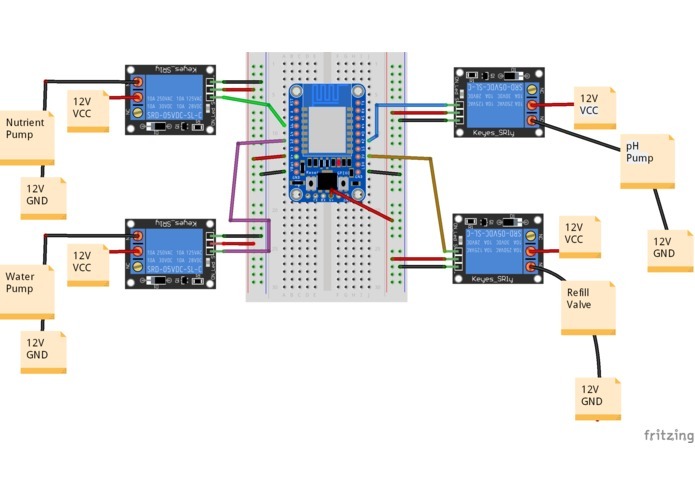 The system is maintained with a series of ESP8266s controllers using a Samsung Artik 5 as a centralized gateway. 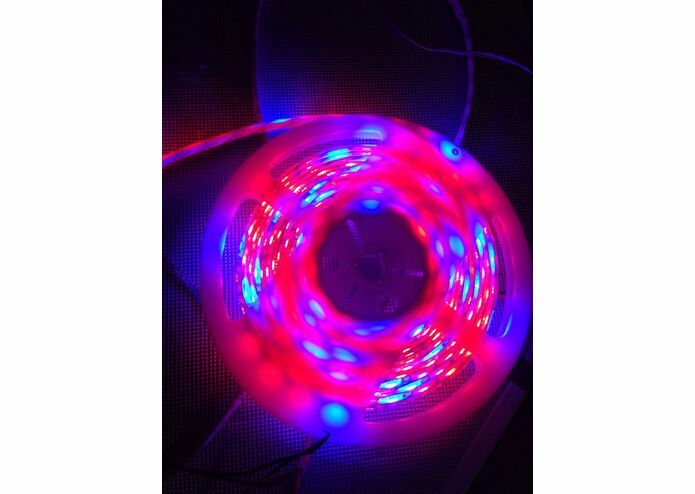 Watering cycles, pH levels, nutrient levels, lighting cycles and ventilation fans are all maintained via the Arduinos and Artik. 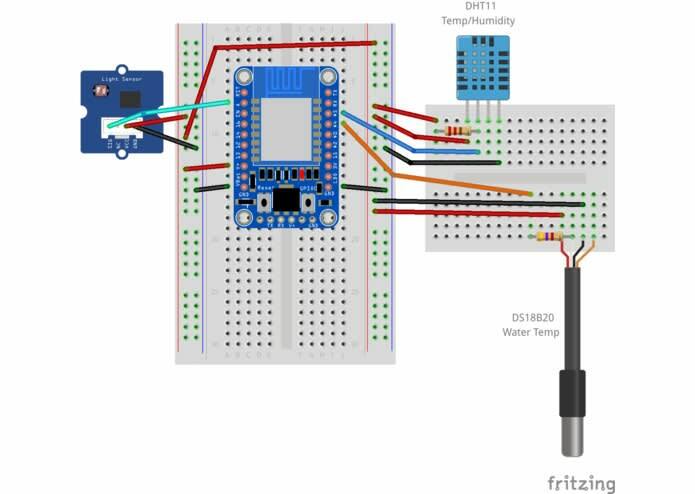 The ESP8266s are networked to the Artik via WIFI to allow all system parameters to be monitored and updated in real time. The running sample data is aggregated in the cloud to maintain a historical log of all the systems running data and make it available via a set if web services. 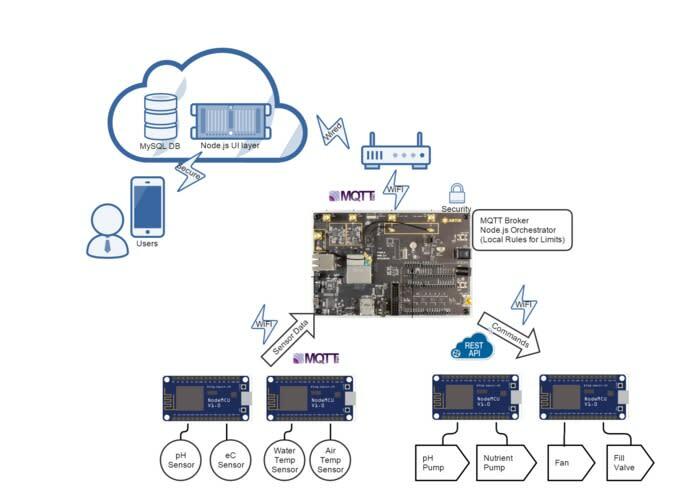 A companion smartphone/tablet app interfaces with the cloud allowing for configuring and monitoring your entire system from anywhere in the world. 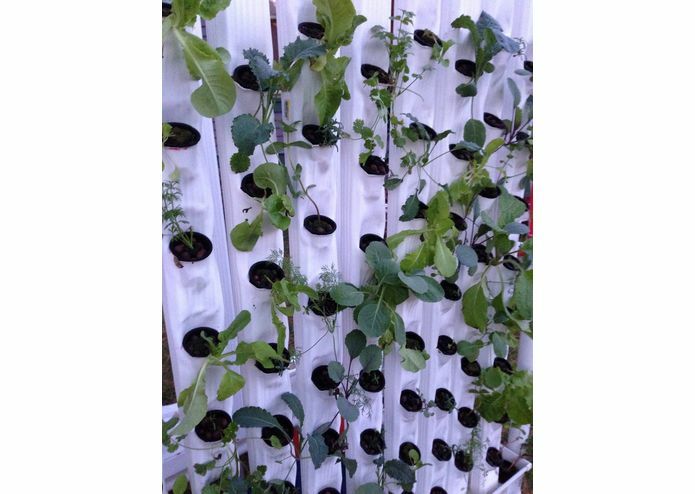 Vertical hydroponics lends itself very well to leafy green vegetables.I am currently growing successfully lettuces (romaine, boston bib, spring mix) , cabbages (red and green), herbs (basil, cilantro, mint, dill, chives), spinach, kale (dwarf curly variety), broccoli and petunias. 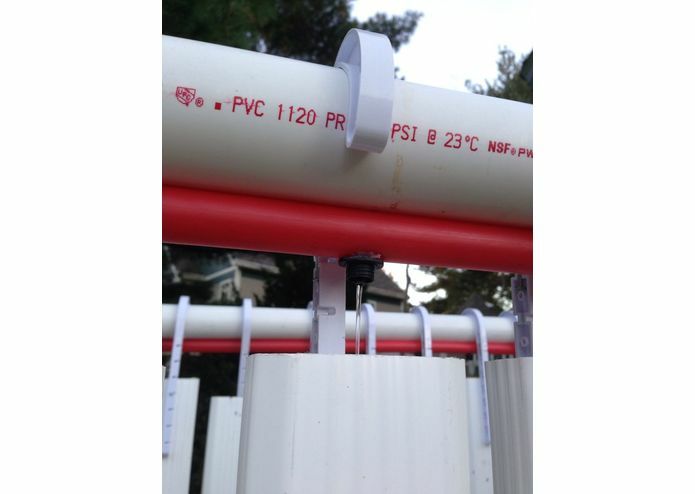 (1) 10' PVC extruded gutter 4"
The support frame is constructed from standard Schedule 40 PVC in 2" and 3" OD(outer diameter). The frame was constructed from this material for is modular properties (easy to fit together) and the ease of use for sizing (easy to cut straight with basic tools). 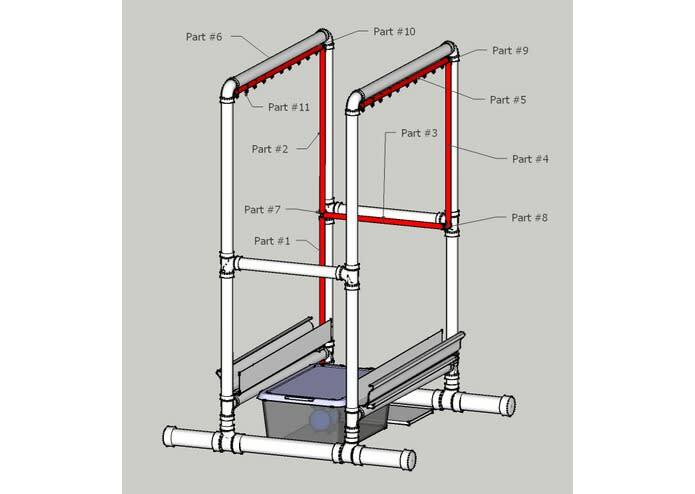 This does not preclude the use of other structural material such as wood, plastic and metal as the frame is structural and does not carry water. 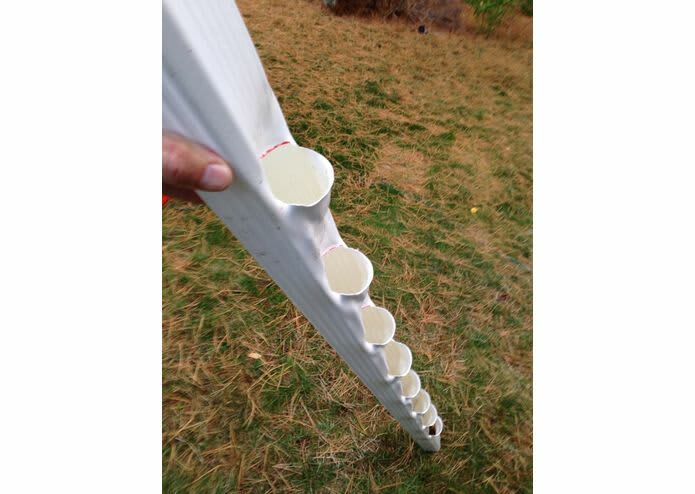 PVC pipe for this project is best cut using a mitre saw. 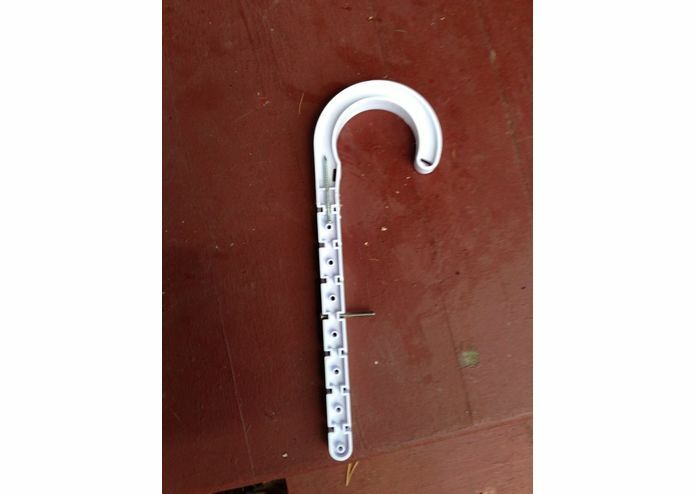 These are readily available as an inexpensive hand tool or an electric/power tool. A mitre saw provides good 90° cuts that help add to the stability of the frame. 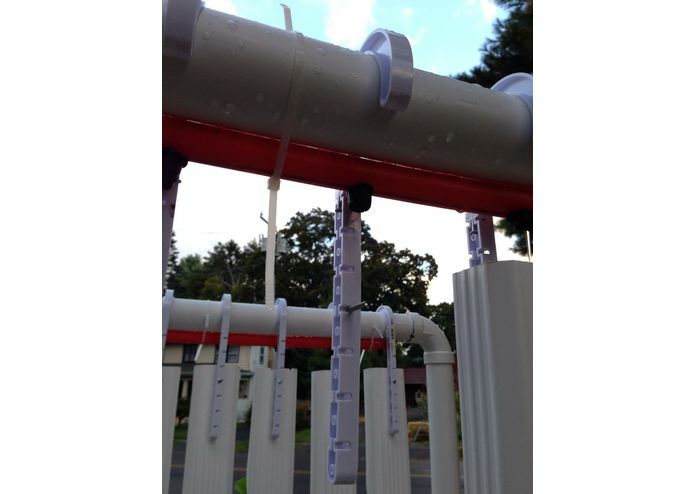 PVC is glue using a two part glue system. 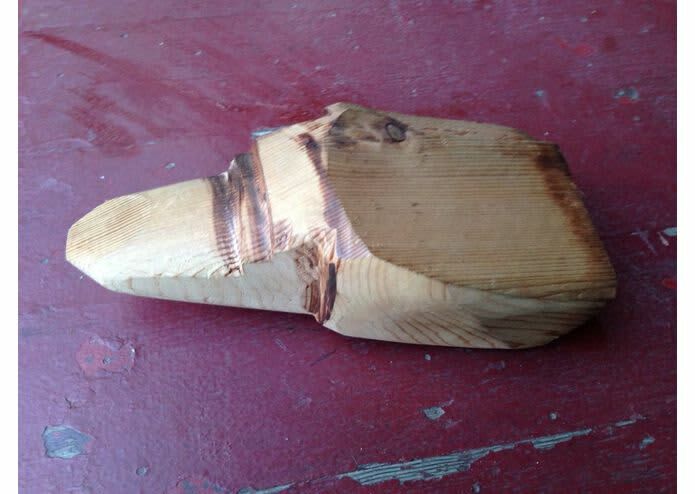 An Oscillating Multifunction Power Tool was used to cut pockets in vertical towers. An Electric Heat Gun was used to shape the pockets in the vertical towers. 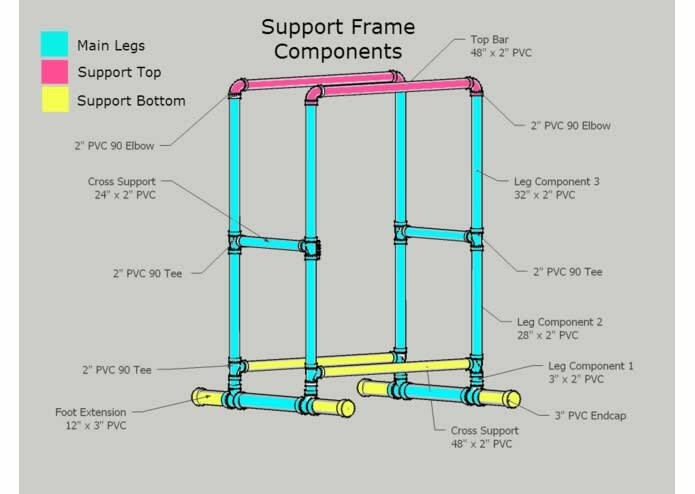 The support frame is (2) main leg components joined by the (2) "top bar" components and (2) "cross supports". The length of the "top bar" and "cross supports" dictate the capacity of the towers your system will support. 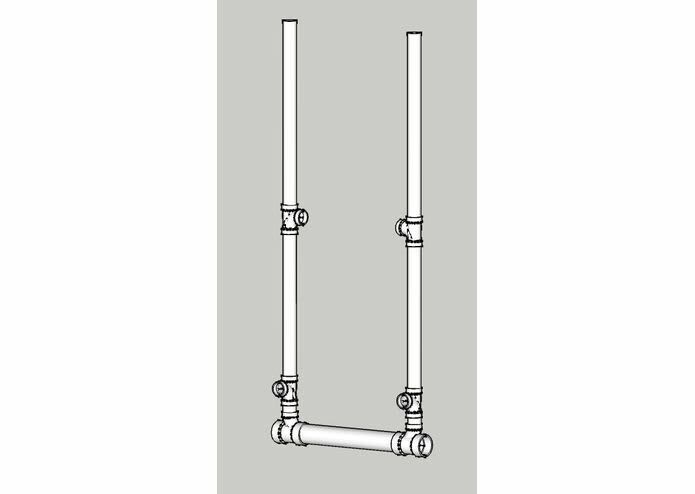 There are two additional leg extensions made from the 3" PVC that can provide addition support against the elements when used outside. These can be omitted for indoor use. At 4' we are supporting (10) grow towers spaced at 4.5" on center apart. The core to the frame structure are (2) identically constructed leg units. We glued our individual leg components together for stability but did not glue them to the cross pieces for ease of disassembly when the unit is moved indoors. 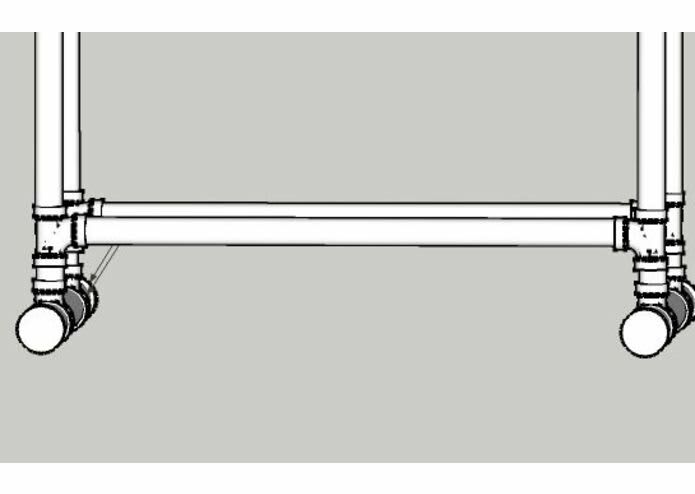 The majority of the legs are 2" PVC with the exception of pieces #4 and #8 which are 3". 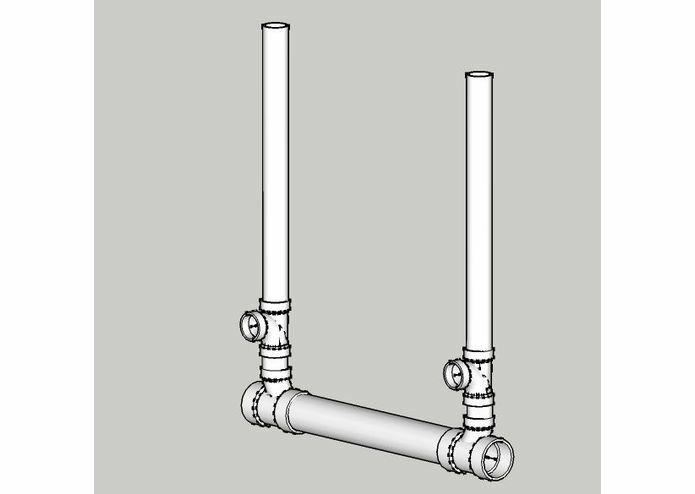 Part #5 and Part #6 are 2" 90° PVC tee's. You will need (8) in all to complete both legs. Part #8 is a 3" to 2" 90° PVC tee. You will need (4) in all to complete both legs. The top support dictates the size of the grow system and the number of towers the system can support. 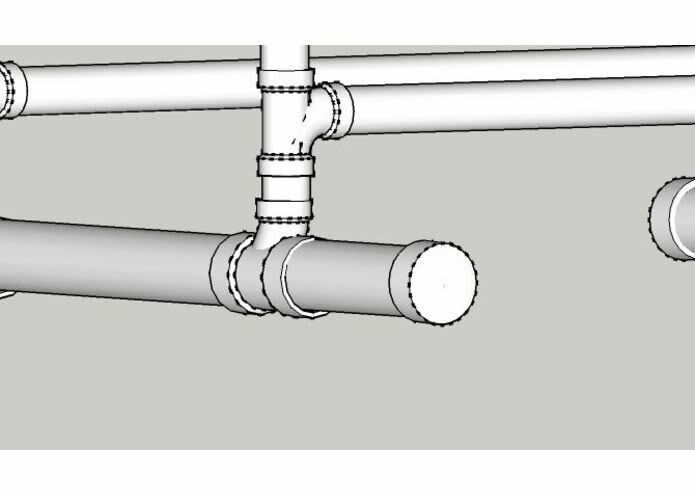 Our current plan includes a 4' length of 2" PVC with towers spaced at 4.5" on center. The spacing can be modified to support larger growing areas by increasing spacing between the centers of the towers. 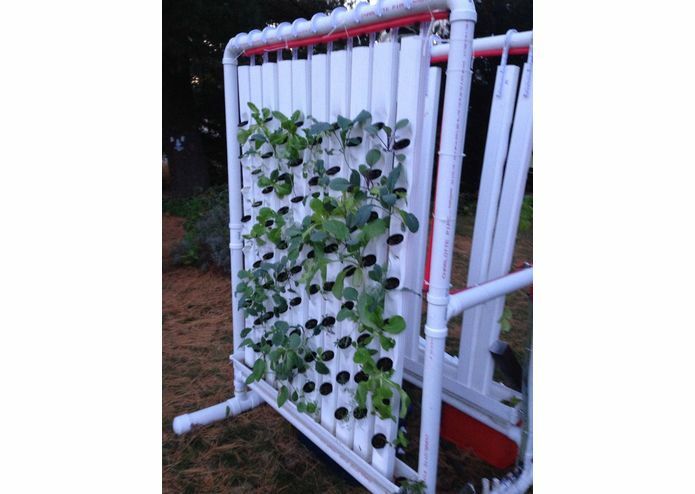 Additional you can decrease the length of pipe to support a smaller number of grow towers. 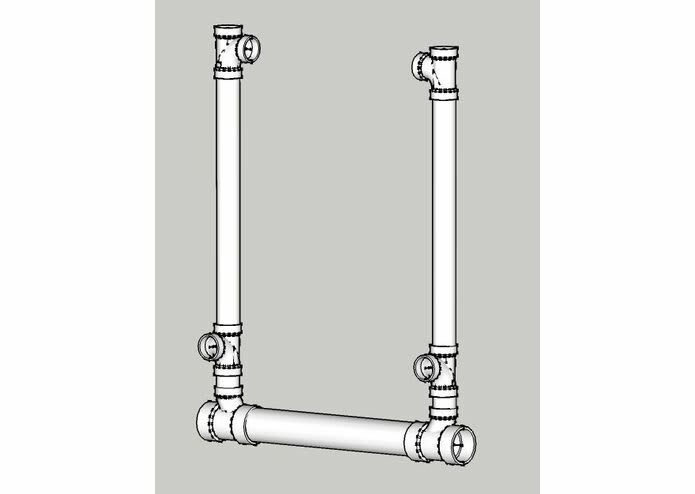 The support top structure are (2) identically constructed units. Like the top support, the bottom cross dictates system size, the piece must be the same width as the support frame top. Our current plan includes a 4' length. The support bottom piece are (2) identically 4' sections. 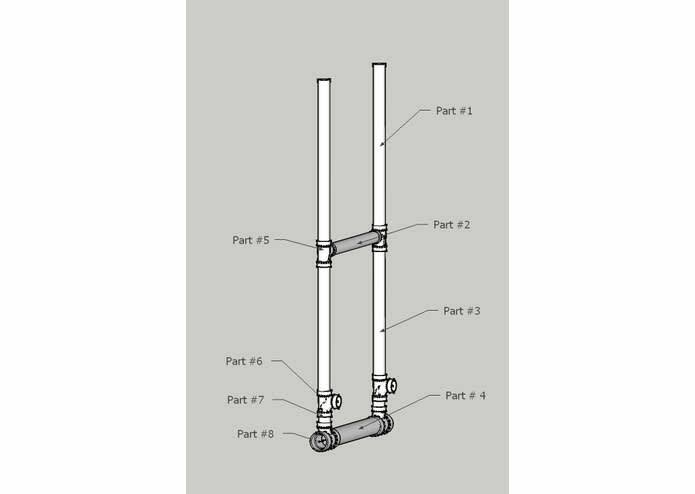 Also included in the bottom of the frame are (2) optional extension legs that are good when the unit is set up outside to provide additional support against wind. 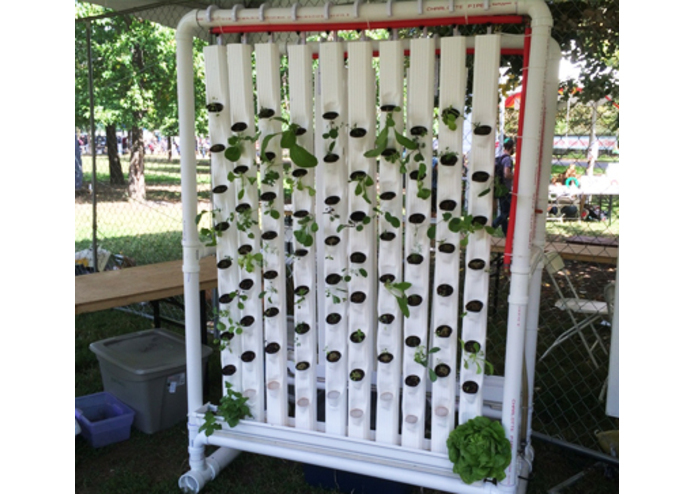 The towers provide the grow area for the plants in this system. 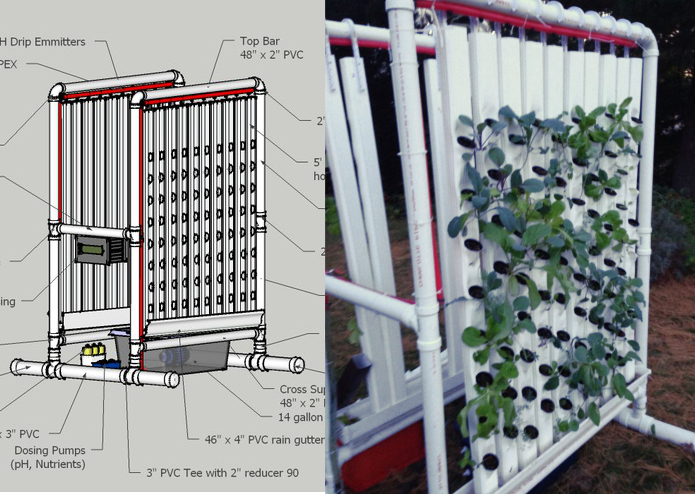 Or current design supports a very high density of plants by spacing the 3" vertical grow towers 4.5" apart on center (distance from center of tower to neighboring tower), providing approximately 1.5" between towers. 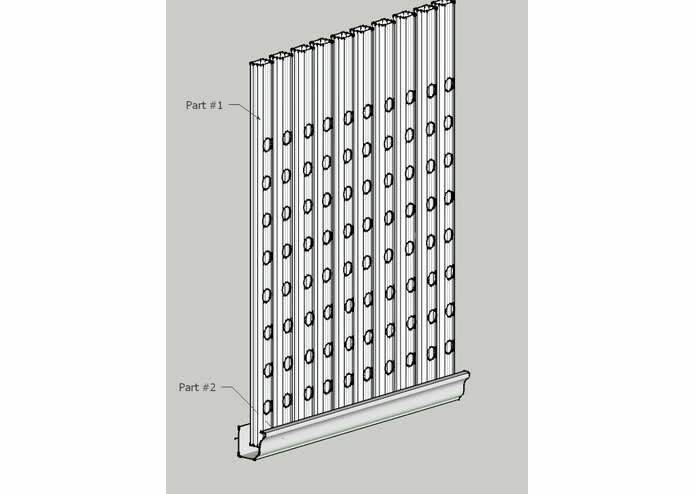 The current 4' length supports (10) towers with (8) slots per tower. With two sides we get (160) plants for our entire system. There are some limitations to this high density and vertical grow systems to the types of plant you can grow. We are continuing to test the limits of what we can grow and will share our successes and failures in our What to Grow sections of our wiki. 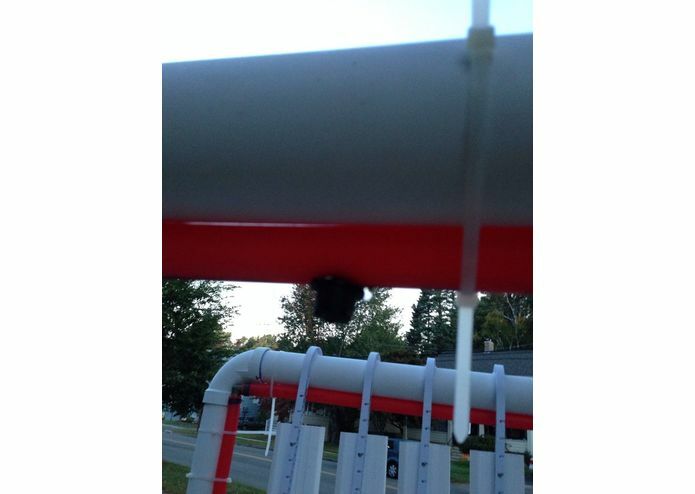 The towers are 2" x 3" PVC modified downspouts. 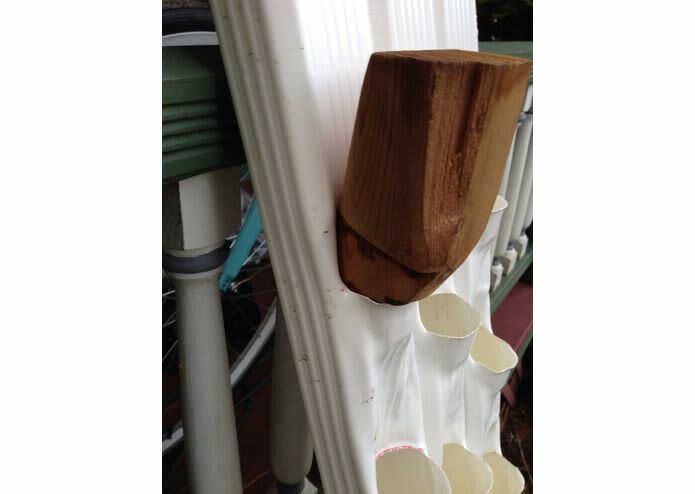 The downspouts are generally available in 10' sections. The availability of 10' sections dictated the 5' height of our design. The water returns are 4" PVC rain gutters. Also available in 10' sections. They are cut and capped on the ends with gutter caps. Make sure you pick up both left and right versions of the end caps as they are different. 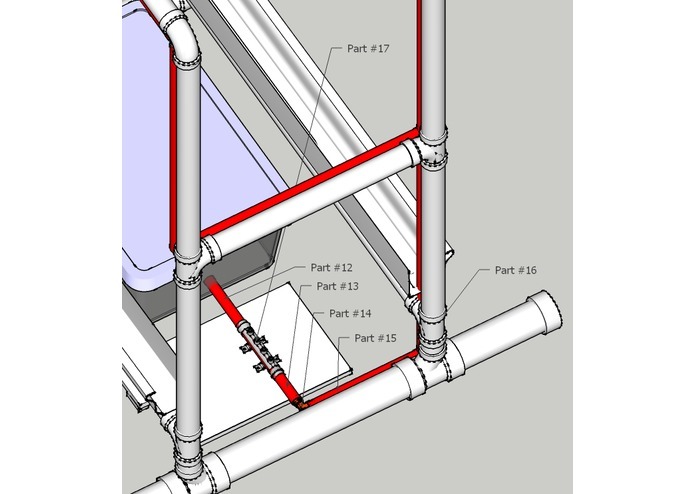 From a 10' sections of 2" x 3" PVC downspouts Cut (10) sections in half at 60"
Divide the (20) towers in to (2) sets of (10). To improve grow space we offset/stagger the plant slots in the grow towers. Mark a horizontal line across the front of the first set of (10) towers every 6" starting 6" from the bottom for (8) lines. Mark a horizontal line across the front of the first set of (10) towers every 6" starting 9" from the bottom for (8) lines. Using a Oscillating Multifunction Power Tool with the straight cut bit, cut a 2" slice on the drawn lines. Using the Electric Heat Gun soften the plastic for a few seconds (approx. 15-30 seconds depending on wattage of your heat gun) 3" above and 3" below the cut. 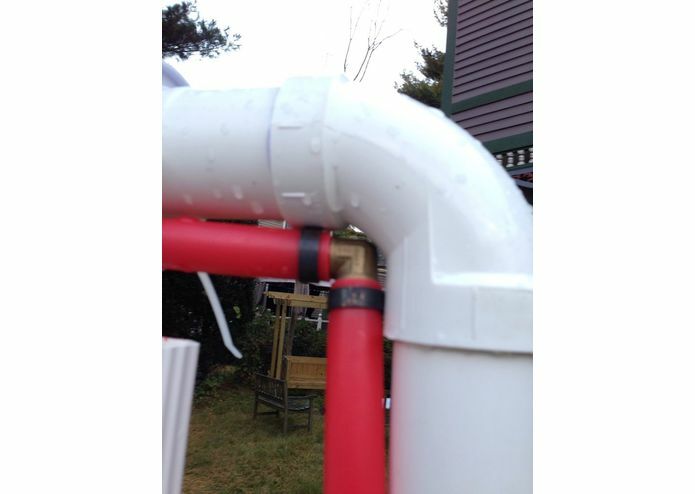 The PVC will start to pucker or sink and takes on the appearance of wet saggy paper. 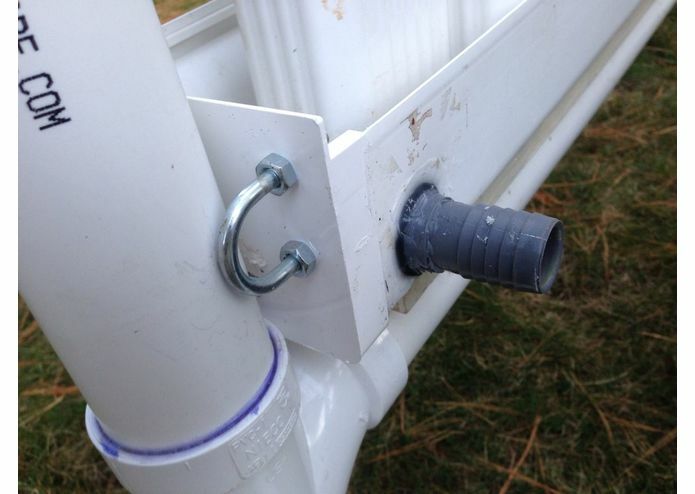 Use your wood template to slide into the softened PVC at the cut. Hold in place for approximately 30 seconds. Repeat for remaining slots in the tower. Drill a 3/16" hole on the top, back side of the tower to put the screw for the tower hanger. 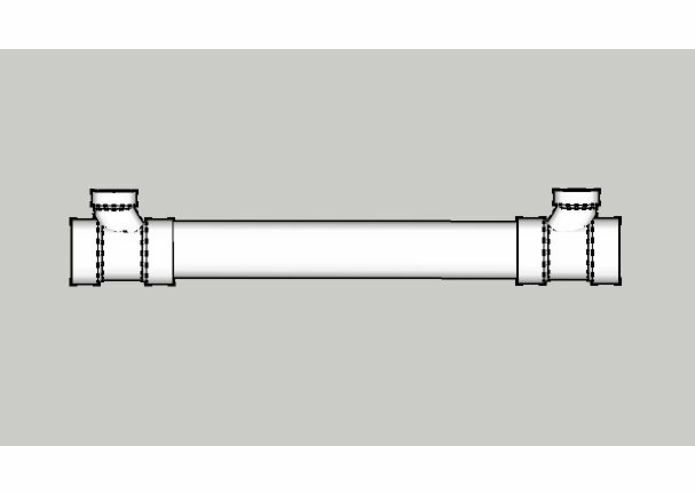 Cut (4) sections at 46"
Identify the right and left gutter end caps. Test fit end caps on the sections of gutter. We roughed up the gutter plastic with some 150 grit sandpaper where the caps overlap the gutter (about 5/8") for a better adhesion. Spread a liberal bead of silicone PVC adhesive on the inside overlapping edge of the end caps. 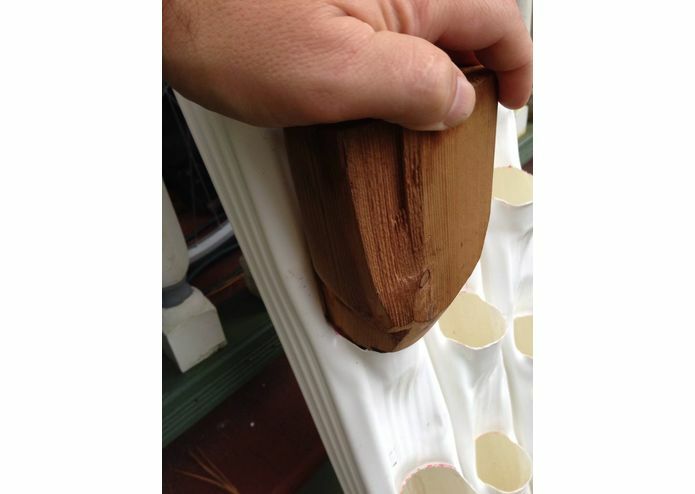 Carefully fit the end cap on the gutter making sure glue contacts all around the gutter material. 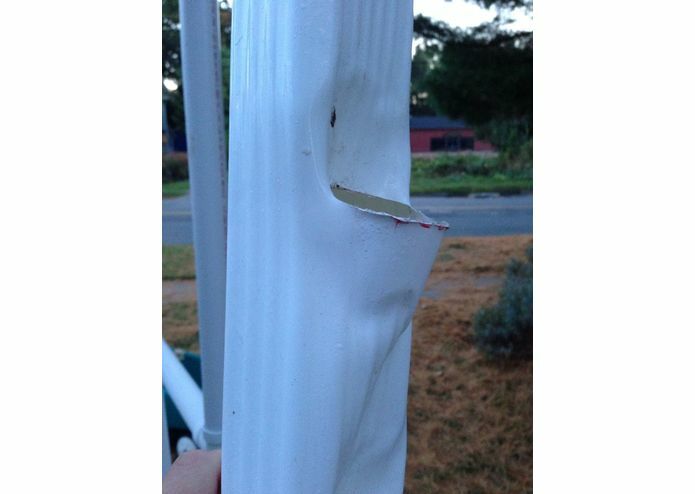 We used our finger to push excess adhesive around the edge of the gutter and cap to ensure good contact. Place a piece of masking tape or other easily removable tape on the cap till the recommended dry time. Repeat for other 3 sides and set aside till dry. 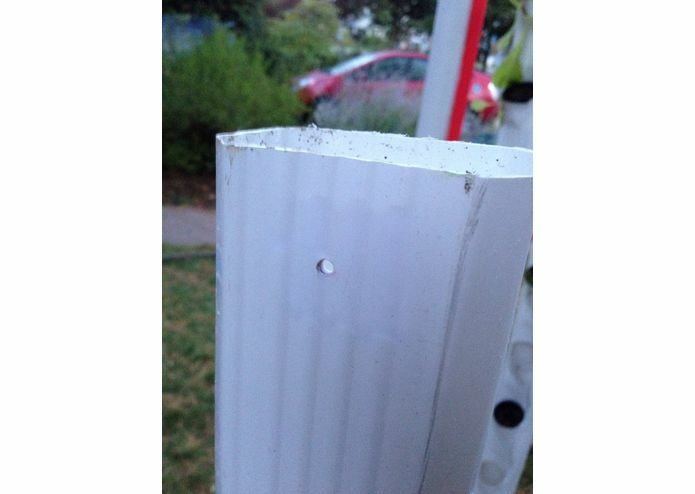 Drill a 1" hole on the back wall of the 4" gutter to insert 1" to 3/4" barbed adapter. This will serve as the connector for the water return to the 14 gallon bucket. Thread the 1" threaded side of the adapter and thread into the female 1" connector on the inside of the gutter. 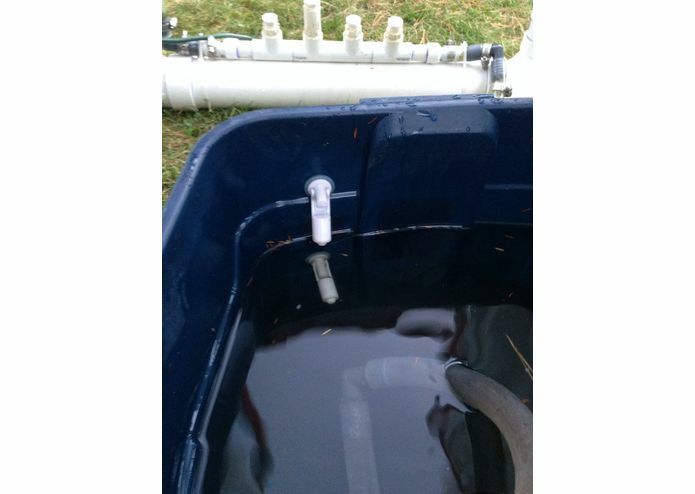 Cut a (2) - 12" section of soft 1" vinyl hose for each side of the water return. Join at the center with the 1" barbed tee. 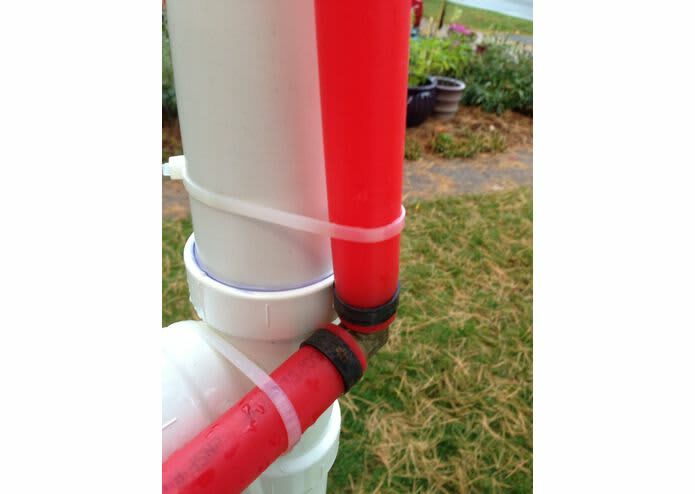 Cut a section of vinyl tube to length to where you position your 14 gallon water tank. 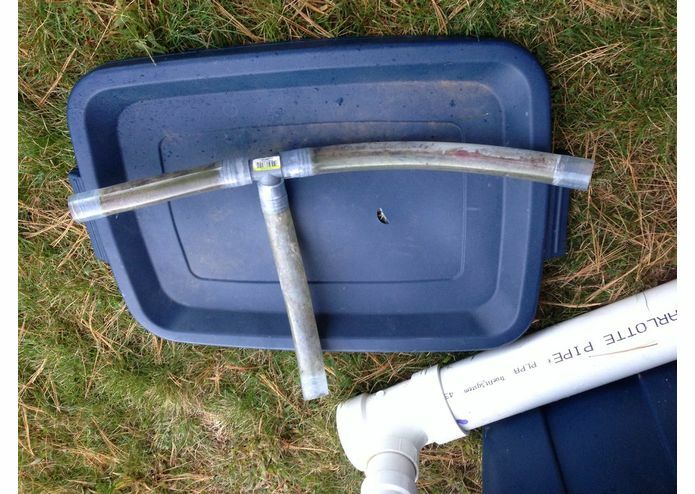 We choose 3/4" PEX for the main water supply lines for it's potable water safety properties and the ease of installation because we had a PEX crimp installation tool. 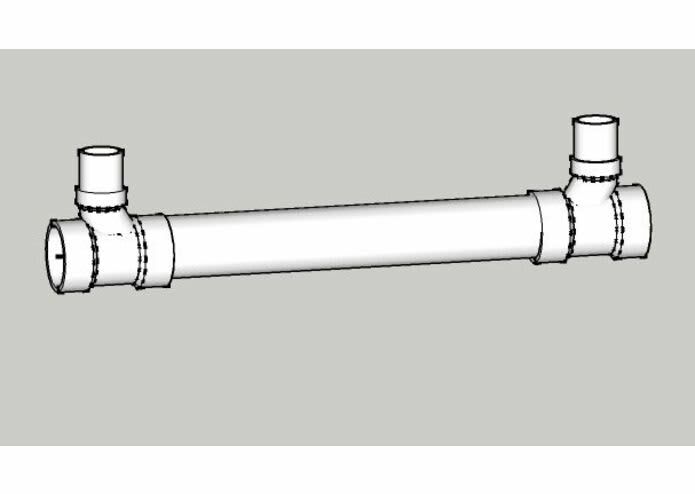 CPVC would also be an excellent choice if the crimp tool was not available, CPVC is also certified for potable water but requires glue and joint connectors for assembly. The water supply is laid out so there is a single rise that forks at the center cross piece of the main leg. 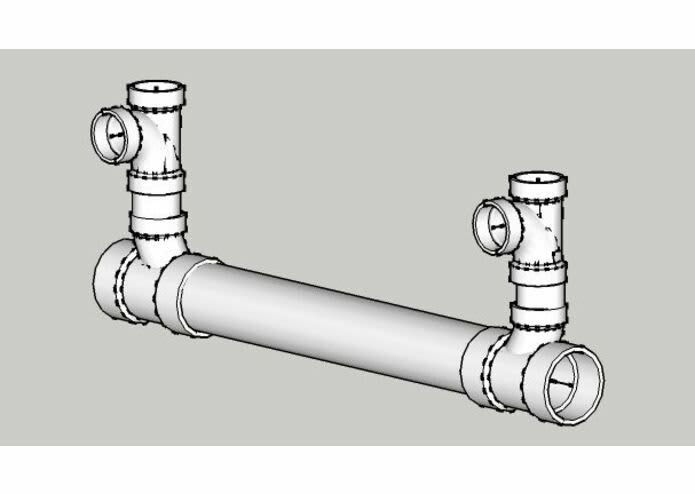 This design was implemented to reduce the overall height load on the water pump. Instead of (2) 6' rises reducing overall water flow, the rise is slightly more efficient to the pump. Parts #1 - #6 are 3/4" PEX cut to mirror the main leg dimensions. These are best sized by taking the measurements of the legs. Crimp Part #1, Part #2 and Part #3 together with Part #7 - 3/4" barbed PEX tee. Crimp Part #3 and Part #4 together with Part #8 - 3/4" PEX 90° elbow. Crimp Part #4 and Part #5 together with Part #9 - 3/4" PEX 90° elbow. Crimp Part #2 and Part #6 together with Part #10 - 3/4" PEX 90° elbow. 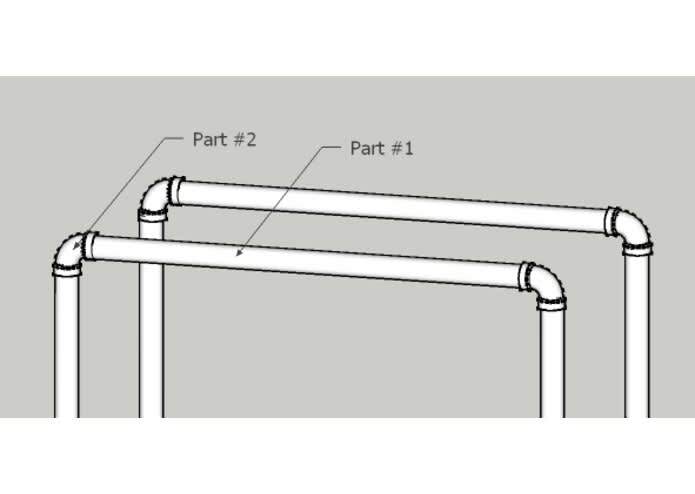 Drill holes in Part #5 and Part #6 for Part #11 - drip emitters. 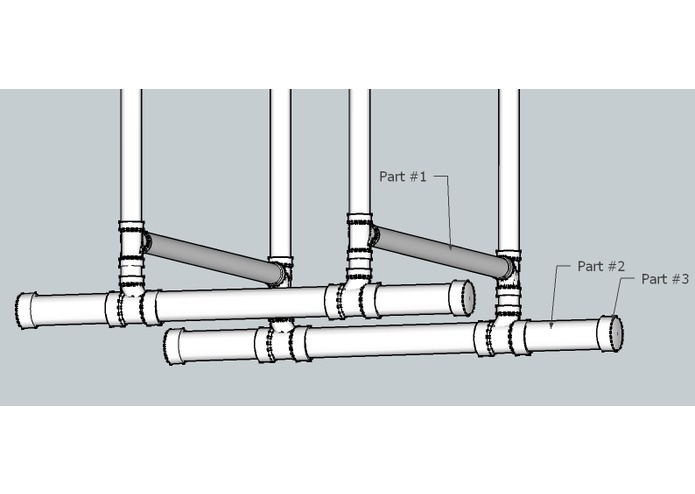 Starting at elbow end of Part #5/Part #6 - measure from end 4" and mark first hole at the bottom of the PEX pipe. 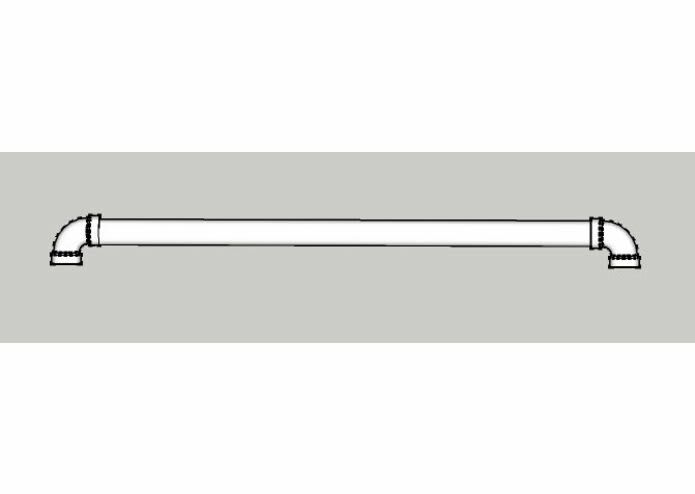 It is helpful to draw a line along the bottom of the PEX pipe marking the bottom for the remaining marks. Measure 4.5" from first mark and make a second mark. Repeat every 4.5", the last mark should be 4" from the opposing leg from the elbow. Using 3/16 drill bit drill on the mark. 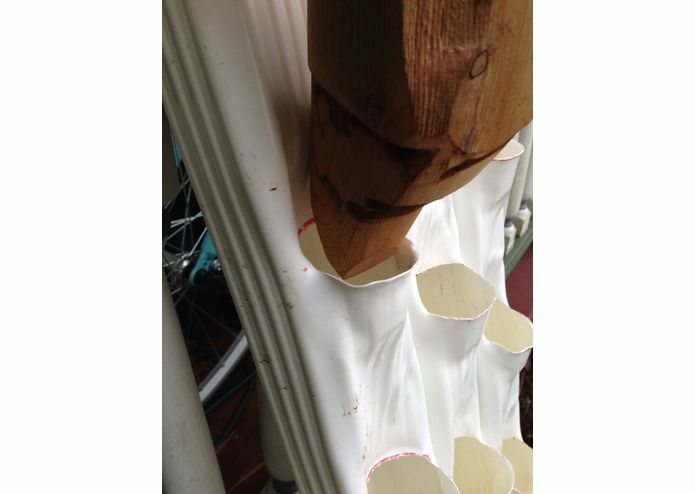 The hole is slightly snug for the drip emitters to prevent unwanted dripping, soften the PEX briefly (30 sec.) with the heat gun, this will allow for easier insertion of the drip emitters into the PEX. Cut a 1" hole in the 14 gallon water bucket. 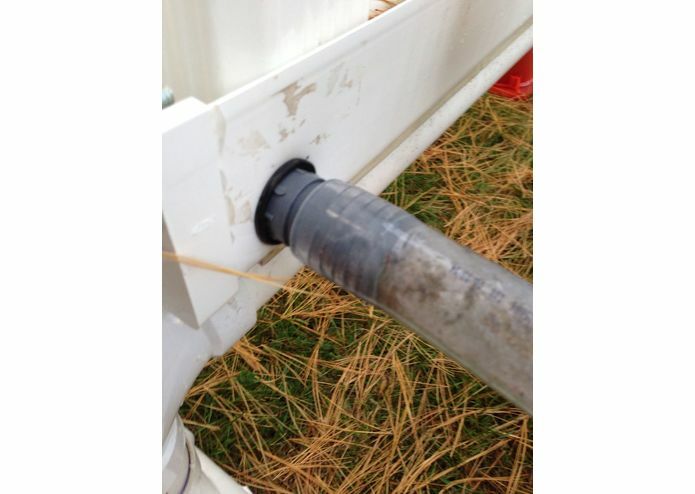 Thread the 1" to 3/4" barbed adapter through the wall of the water container. 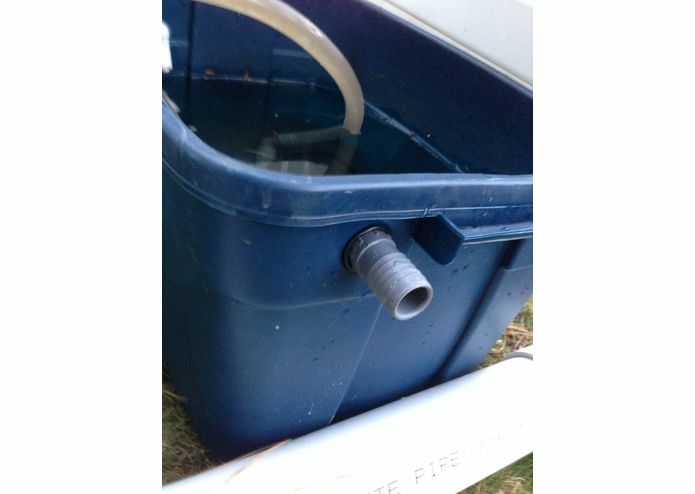 Attach the soft vinyl hose from the return gutters tee to the water bucket. Used to detect and maintain environmental data. 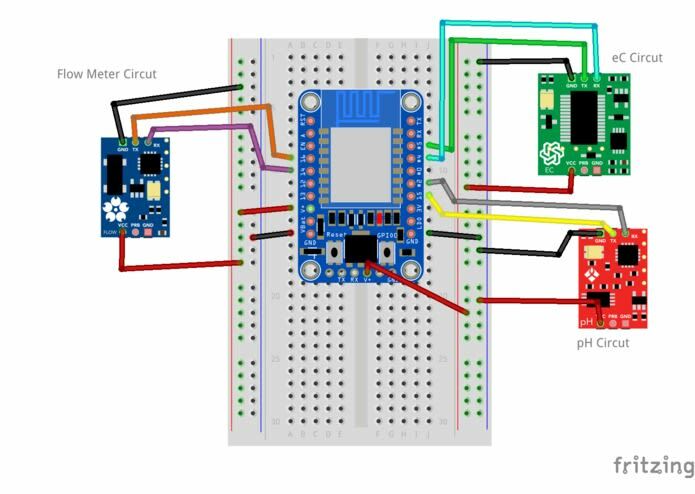 Sensors for air temperature and humidity, water temperature and light. Relay example wiring. Repeat for all your actuators (fans, lights, heaters). Follow the Getting Started guide that matches your development environment; there are guides for Windows, Mac and Linux. We used the ARTIK as an orchestrator, gateway and message broker for our sensor and actuator units. You need to set up Node/NPM and Mosquito on the ARTIK to act as a MQTT server/broker. Initial Setup Install node and npm on your ARTIK board. Log in to the terminal on your ARTIK device via ssh or the serial connection. Enter the commands noted. The downloads may take some time to complete. Start Mosquitto (message broker) and run it as a background process. We deployed our orchestration engine, developed in Node.js, to the ARTIK. I would have to say the biggest challenge we ran into was the cost of the equipment, in particular the higher end sensors (pH, eC and flow). The main grow structure cost approximately $350 at my local hardware store; this included all the PVC, PEX tubing, brass connectors and vinyl tubing. We went with the cheapest sensors would could find but struggled with quality and the sensor being the right type of protocol (Analog vs. Digital vs. I2C). In future versions we will be using the higher end sensors. The schematics above for Water Condition reflect the higher end sensors. We were very happy with our first crop of lettuces and herbs. It was nice to see the project come together initially as a viable way of growing food and then the marriage of technology to make it something that could be used by others. We designed our software portal to be a hub and growers resource for users to learn from each other. Users can contribute their success and failures to help the community find the best "plant recipe" for their desired crop. Our plan is to encourage others to build our system and contributing their data so that others can get a jump start on their own gardens, maximize their results, reduce their loss due to inexperience and hardware failures. We look forward to finding a way to bring our design to others to help solve issues related to drought, food shortages, food quality while reducing the carbon footprint required to bring quality local food to people. 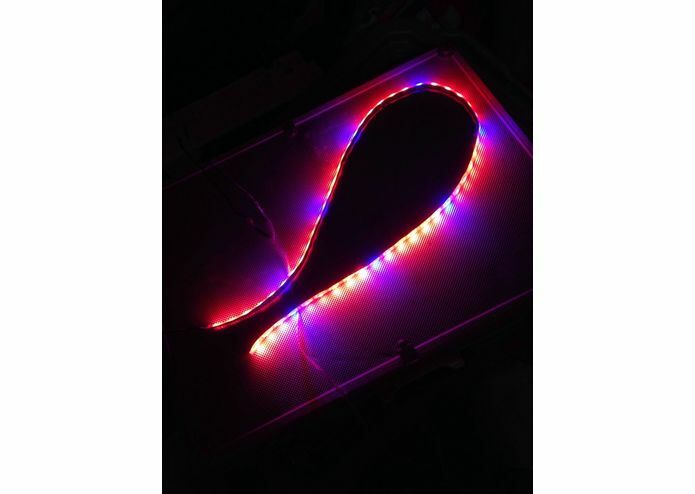 I am the creator of this project.